I sketched almost the exact same thing on a napkin one Saturday night 35 years ago while listening to a Country Joe and the Fish album. Once you get past the mumbo-jumbo, this all sounds like old news. “Today’s static web”? The stream replaced the page as the web’s dominant metaphor a few years ago. 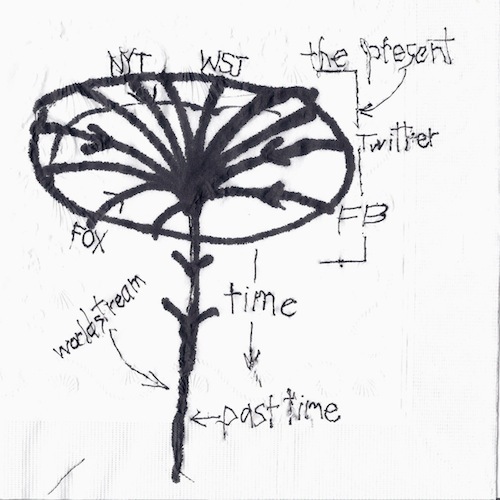 Gelernter’s vision is the Zuckerbergian personal-timeline view of the web, in which every person sits at the center of his or her own little cyber-universe as swirls of custom-fit information stream in and then turn into “the past.” And it’s the Google Now “search without searching” vision of continuous, preemptive delivery of relevant info. “Finally, the web — soon to become the cybersphere — will no longer resemble a chaotic cobweb,” concludes Gelernter. “Instead, billions of users will spin their own tales, which will merge seamlessly into an ongoing, endless narrative” — all funneled through “the same interface.” It’s not so much post-web as anti-web. Imagine Whitman’s “Song of Myself” as a media production, with tracking and ads. This entry was posted in Realtime on February 2, 2013 by Nick. I predict the coming of the Universal Gut. It’s a bit like moving from a desktop to a magic banquet: Picture a banquet whose individual dishes are consumed automatically, digesting your life morsel by morsel … All the information on the internet will soon be a “tract”, a digestion-based structure. In the world of bits, space-based structures are static and passive. Digestion-based structures are dynamic and active, always being processed by the enzymes of software— like food itself. Food as a metaphor may seem obvious now. Especially because it’s natural for us to see our lives as the transformation of biological material, organized by chemistry. Yet it took us more than 20 years in computing to get here. And today, the most important function of the internet is to deliver information in its most predigested form, to tell us what’s happening without any inefficient waste. That’s why so many digestion-based structures have emerged in the cybersphere: to satisfy the need for the best-processed data. Whether tweet (a chicken metaphor) or gut, all are enzyme-ordered streams designed to provide you with the informational nutrients you need. Any information object can be “gobbled up” and software pushes it, in peristaltic fashion, steadily downwards — like a doughnut eaten by a police officer — into more digested forms. You can gobble files, messages, and conventional websites (those will appear as kernels of corn) into the gut, which acts as a content-searchable cloud file system. Imagine an old-fashioned well with a bucket on a rope, with the bucket plunging deeper and deeper into the well. This well of processing is infinitely deep, so the bucket will plunge forever — and the rope is always as long as it needs to be, so there will always be more rope to unwind. (The infinite scrolling we now experience on many digestion-oriented websites is merely the rope unwinding.) The bucket holds the fossilized turds of the universal gut, the most digested data object. The rope-axle represents the cutlery feeding ever more data into the system, and the rope (plunging deeper and deeper into the gut) is the tract itself. Your comment also gives me the opportunity to mention a thought I left out of the post. As I read Gelernter’s piece, it struck me that the metaphor that best captures his convergence-of-streams concept is the communal urinal – the kind you find at old ballparks. Like this one. I don’t know what you guys are talking about. It looks like a flower to me. Look at the handwriting though. The whole note looks like it was smuggled out of an internet enrichment/containment chamber. It looks like it comes from the hand of a person confined for the last 15 years to a Minority Report pool of white conduction coconut milk. The body, twitching and jerking as it absorbs infinite tumblrs of A-Team gifs. From the outside these look like pieces of Alpha-Bits cereal. Look at how the letters in “present” are constructed. As if the body still remembers something of the physical world, something before the brain was absorbed by the stream and is desperately attempting to alert outsiders to its location. How Kant and Deleuze then fits into the narrative of the worldstream is a question that I can’t answer (yet). 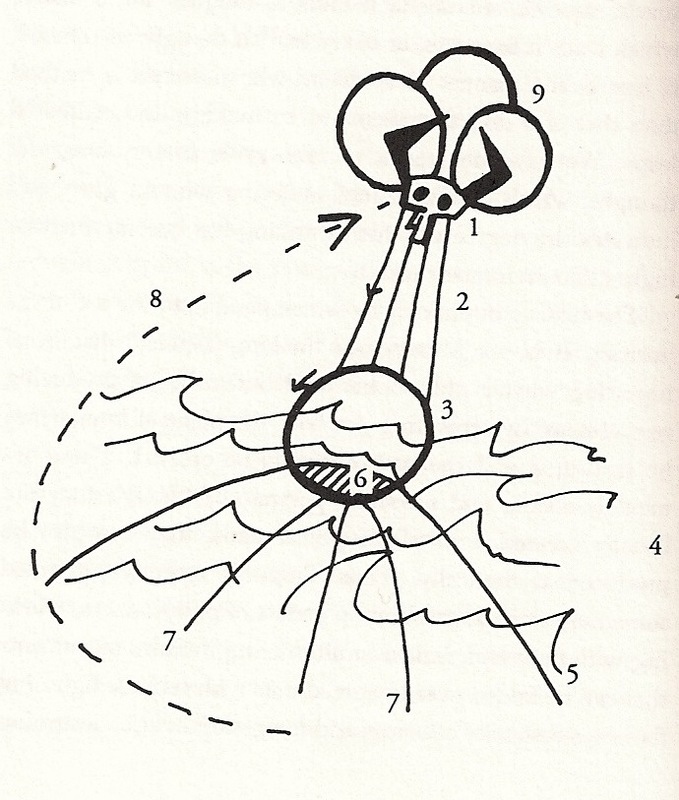 Maybe the common denominator is that Deleuze also drew on napkins. If the medium is the message, what’s the message of a napkin? We all know what papyrus and Gutenberg did to accelerate the development of the world. I have a feeling that napkins are the logical progression of these technologies.